This spacious lake front home is located on a tree covered lot just outside of Nashville, TN and is the perfect getaway with beautiful lake and sunset views. You will be impressed when you step in the front door to the large living room with a wood burning fireplace which is connected to a spacious kitchen. The large picture windows provide a spectacular view of the back yard and lake. There are two sets of glass doors for easy access to the screened porch which is a great place to enjoy breakfast or a relaxing afternoon drink with cool outdoor breezes. The Master Bedroom has a private bath and private access to the upper deck, excellent for star gazing with the one you love. This home also has 3 more spacious and well-appointed bedrooms located on the main floor. Downstairs there is a large family room with huge 8’ HD Home Theater projection TV with incredible surround sound for movies or watching your favorite sports. This room also has a gas fireplace and kitchenette. The lower deck extends the full length of the back of the home and has open and a covered areas. Relax while enjoying the porch swing and hot tub overlooking the lake. 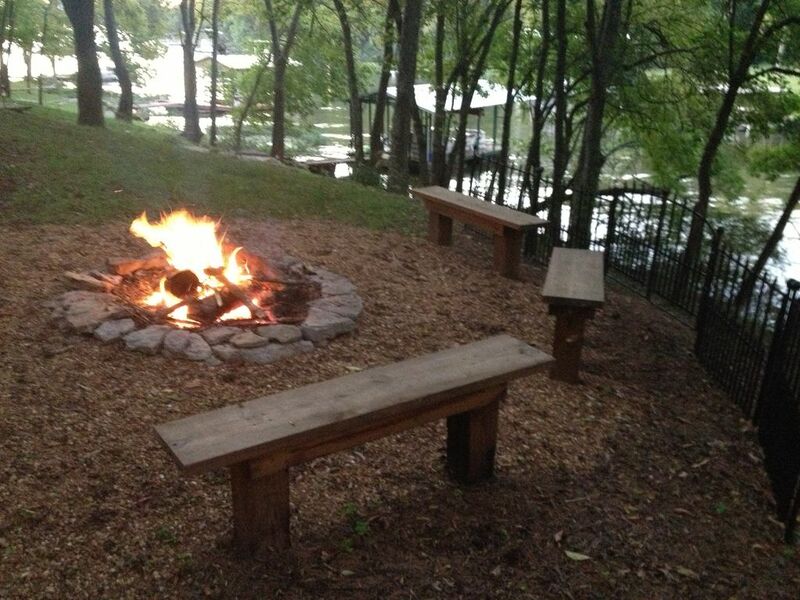 A stone pathway leading to the fire pit and boat dock is lit at night and beautifully landscaped. Sitting by the fire in the evenings while roasting hot dogs, marshmallows or just telling stories will make memories to cherish with family and friends. We invite you to enjoy the private covered boat dock, so bring your boat/jet skis or rent a pontoon to enjoy the 22,000 acre fresh water lake. This home is a Nashville Vacation Rental Home Property. This home is the very place you are looking for if you want to relax and enjoy a getaway on the lake, in the country, away from the noise, hustle and bustle of the city but close enough (only 30 minutes) to all that Nashville has to offer!! It is the perfect balance for relaxation and excitement. Our home is so spacious and comfortable, our guests can actually find a quite space to read, reflect, and relax while vacationing with friends and family. The water, wildlife, fire pit, comfortable spacious accommodations, and convenience to the city makes our home a most desirable location for your stay. All cars must be parked in the driveway. No parking allowed on the street and yard. There is a large spacious living room on the main floor open to the kitchen and dining area. (6) TV's in each bedroom, on the screened in proch, and a large projection TV in the large media room. Upper and lower decks extend the full length of the back of the house. The decks provide both open and covered areas as well as a screened in porch. Family Room with Large Screen Projection TV/DVD Screen, Wet Bar, Hot Top, Microwave, and Fridge, Fire Pit with In-ground Benches, Covered Boat Dock. Please contact us for additional properties availability. Excellent house. Had a great time. Owners were very nice and helpful. Convenient location to commute back and forth to Nashville. Beds were extremely comfortable. Perfect getaway with friends and family! It was a beautiful, spacious house! So many things to keep the kids busy. Kim was wonderful to work with! We had a great time! Overall very nice, comfortable, and plenty of space. Nicely furnished. Enjoyable place for a large group to gather. Had a great time. This home was the perfect place for our group. Home is spacious and very clean. We rented this lake front home for our group of 7 and it more than met expectations. The view is beautiful and the owners are so easy to work with. House was very clean and the lot was gorgeous. Had every amenity you could want. The weather wasn't the best but that just made the covered hot tub, theater room and collection of games even better! The owners were there to greet us when we arrived and couldn't have been nicer or more accommodating. I highly recommend this house. Lovely home and was just as described. It felt just like we were home, very quiet neighborhood, and the house had everything and more than you needed. Would definitely stay again! Thanks Dan and Kim. Weekends, Holidays and Special events rates may change your rates, Or minimum number of days. CMA rates are based on 8 people, $50 each additional person. Check in is 4 pm CST Check out is 10 am CST This property has a septic system. Only septic safe toliet paper. None registered guests are not allowed on the property with out prior arrangement and approval. Rental Agreement required at check in. All guests must sign the agreement.